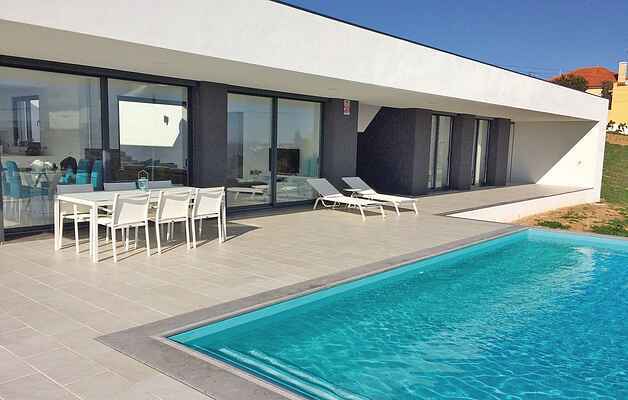 This modern holiday villa offers a breathtaking panorama view over the surrounding mountains and is located in the middle of a wine route of UNSESCO. All the rooms are distributed over 200 square meters of living space and are distributed on one level with the terraces and the pool. If you appreciate privacy, then this holiday villa is just the thing for you! In only 15 minutes by car, you reach the famous coastal town of São Martinho de Porto and Nazaré. On the Atlantic coast you can try new water sports in the sailing and surfing club. Also in the surrounding area you can enjoy a variety of leisure activities: golf, hiking, horseback riding or bicycle tours, here you will surely not get bored. For our little guests there are two water parks nearby. Info: The pool can be heated on request, for a small price surcharge!